Those who support Australia’s exorbitant house prices and new economic model of Quarry Australia usually rationalise that support with figures showing that household income growth is strong and widespread. Well, no longer. 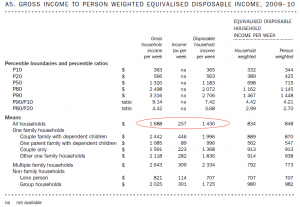 The average Australian household is getting poorer. With all the self contratulation going on between mining, banking and real estate, you’d think we’d all be driving Maseratis and gargling with Veuve Cliquot by now. Bet you a schooner that this won’t get a run in the MSM…..
I’ll take that schooner bet. MSM love running the pessimistic stuff at the moment, plus we all know they’ll be reading this article given that most of them have been macrobated! Agree. Its all doom and gloom out there – the recession meme has taken off, that and Macrobation. Is that what you do when you don’t have a Health Services Union credit card? Dont tell me another mainstream econartist, sorry, i meant economist has no idea what they are talking about? Whenever economic news from the real world is getting you down, read Craig James. Guaranteed to give you a laugh. 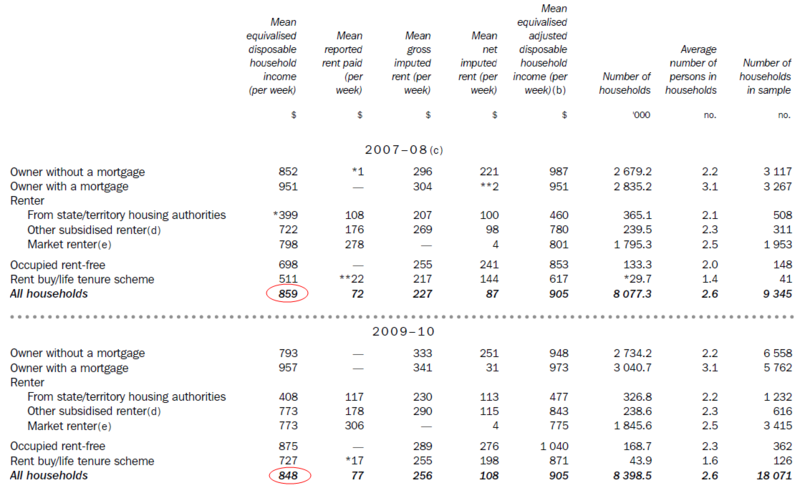 Any reason for focusing on the these figures rather than the equivalised household disposable income figures? They are adjusted for household size, so they provide a truer measure of changes in Australians’ standard of living. Another proof lifestyle improvements are due to households taking on more debt than ever before. As it is obviously not the income growth. We are about to find out how sustainable this economic practice is. Although a small comparison (i.e year on year) it doesn’t bode well for those who claim disposable real income increases 4 to 5.5% a year…. Not in any particular order – the whole of Federal Treasury, RBA, Chris Joye. That’s false. Defamation perhaps. Kris Sayce tried that. Saw your ‘No mention of “real” or after inflation in any of that.’ statement below. If you continue with that level of hairsplitting, I don’t think anyone here will take you seriously. Re defamation, I guess whoever went after Kris Sayce hadn’t heard of the Streisand Effect. Come to think of it, I hadn’t heard of Kris Sayce until that incident you refer to. Now I do check his blog once in a while. If you think that distinguishing between nominal and “real” is hairsplitting then I suggest you are well out of your depth here. I am, but a humble student of this blog, without any baggage or the internal contradictions of a typical Bullhawk. Educate me with this example – If a typical Bullhawk is now fully aware that RBA board is a conflicted bunch of manufacturing industry execs, would the Bullhawk’s next rate HIKE predictions be real or nominal? ok.. If it makes you happy, it was just the the whole of Federal Treasury and RBA, and not Chris Joye. Anyway, I don’t know why associating someone with great institutions like the Treasury and RBA is considered defamatory these days! By way of historical context, disposable income on a per household basis has averaged a healthy 5.8 per cent per annum over the last 10 years, and 4.9 per cent per annum over the past 18 years. …. this work suggests that they will likely be 55 per cent higher in 10 years’ time. No mention of “real” or after inflation in any of that. Come on, that’s just childish. If anyone is guilty of selecting obtuse constructs to support arguments, Chris Joye is a beacon. It’s childish to make up assertions and attribute them to known public figures. Ok then. How about these claims. That doesn’t sound like assertion or inappropriate attribution to me. 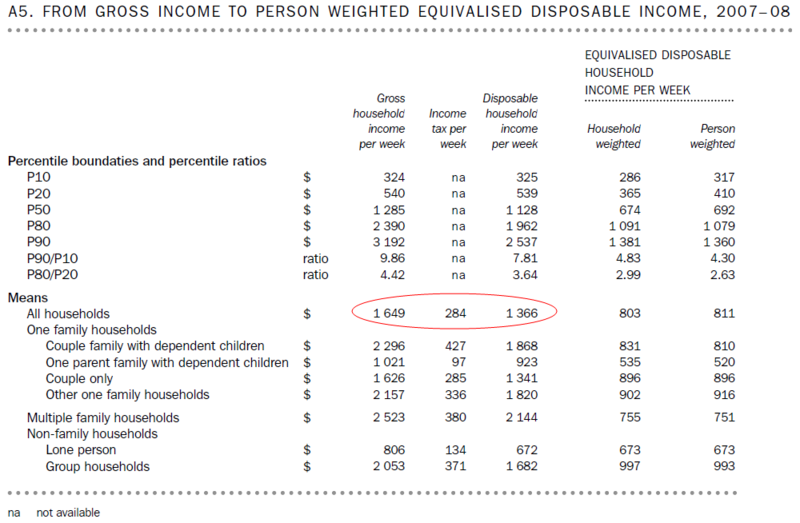 Using national accounts data to estimate a meaningful measure of household incomes is completely flawed. Cameron, off topic, apologies. A few days back you mentioned correspondence with a Swiss colleague and Swiss action to protect CHF against excessive rise, said you might come back with info. If you did, could you please point me in the direction. Thanks. 3d1k – I’ve heard nothing back yet. but will probably post something on my blog when I do. Cameron Murray – none of those quotes support Mav’s assertion. My mistake – I meant nominal in all quotes (income and price rises) above, thanks for pointing it out Foundation. 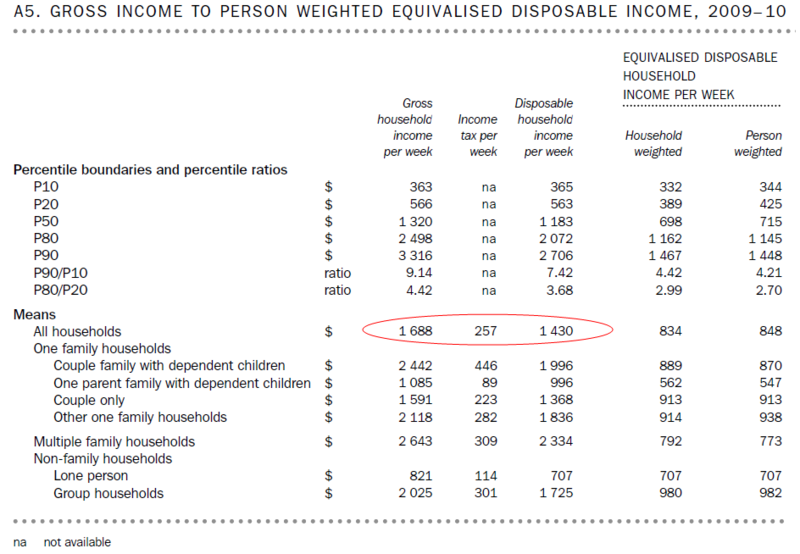 But as we have contended here before, using the National Accounts data (which includes imputed rent, superannuation contributions, Workcover premiums and charity income etc) to derive disposable income per household is not an accurate method. As an endnote, I’d like to know of the 21 economists, which predicted the GFC, or has since created a model that can predict (with a margin of error less than 100%) the rise and fall of GDP and inflation. I’ve yet to come across a “market economist” who can do so. So this is basically just more fudging by the ABS? so is it better for the poor to get poorer as long as the gap is reduced? Like the average American household, the average Aussie household will soon realise that they have been hollowed out – they have been poor all along, but kept from realising that fact by a housing bubble “Wealth effect”. Soon, they will find there aren’t enough jobs to go around as well. While the economy is being hollowed out, Mining + housing bubble is the scaffolding that is keeping the economy from falling apart. Once the housing bubble bursts and Chindia no longer wants our resources, we will be left with McMansions and giant holes that resemble the lunar landscape. “…and giant holes that resemble the lunar landscape.” Touch of hyperbowl there! I’m not sure what you are saying as I actually agree – housing wealth has duped many into feeling, well, wealthy – that an a glorious credit binge on lots of stuff. And with the purchase of Macarthur coal it would seem that some have long term faith in Australian coking coal – demand largely driven by India and Japan. Wonder how the sample is taken? 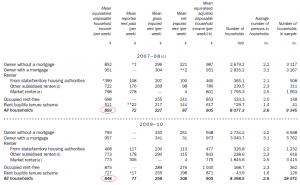 The massive boost in national income has all gone to BHP and Rio’s bottom line. The Aussie household has missed out. don’t forget twiggy, clive and gina!! Where do they now live??? I thought they were all living just outside of Darwin in Palmerston. So the average working renter is $176 a week better off than the average housing commission tenant? or have I done my math wrong? Who wants to bet that breaking down the data by “demographic”, would show the younger generation in a declining situation MUCH SOONER and MUCH WORSE than all this glorious “aggregate data”? I bet there is a demographic bulge that has come up through the data and finally managed to turn the “aggregate” data once it was big enough. It will be all downhill from here. I don’t understand how imputed rents can add to household income… doesn’t the rent that one household pays come directly out of the income of another? Or does rent count as income for the person who gets it, but ‘consumption’ for the person who pays it? Does imputed rent distinguish between land rent (pure economic rent) and the rent of the house / apartment itself (which income from capital?). 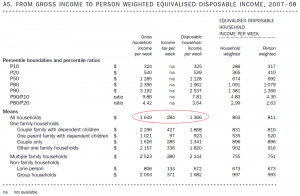 Another reason to not use the National Accounts data for estimating household incomes. Seems to agree with the data on per capita wealth being at 2006 levels (http://ckmurray.blogspot.com/2011/07/real-per-capita-wealth-trend.html), savings rates shooting up, and retail seeing a massive slump in turnover. Stop your whining and spend says Gerry. That’s the sort of blinkered, philistine pig ignorance I’ve come to expect from you non-creative garbage. You sit there on your loathsome, spotty behinds squeezing blackheads, not caring a tinker’s cuss for us struggling billionaire retailers. Well, everyone should of been aware of Gerry’s attitude when he whinged a number of years back at not being able to employ people cheaply enough to look after his expensive nags! Seriously though, Gerry is right…anyone that doesn’t buy a 2nd plasma TV this year is a goddamn communist! Ouch. I still have a tube TV. What does that make me? i dont think you can bring the Palestinians into this..